All too often I have clients that come in for a putting lesson struggling with their consistency on the greens. They tend to miss putts all over the place and believe it’s their stroke which is to blame – which, don’t get me wrong, it most often is. But, sometimes, it’s actually the style of putter they’re using that hinders their natural stroke instead of working with it, and this is what needs to be addressed. Let’s discuss some of the key elements in a putting stroke that can influence the type of putter you should play, and then we can solve this potential issue with your putting you didn’t even know existed! To get started, you first need to determine your natural stroke path. Do you naturally make a straight-back-straight-through path? Or do you find it more comfortable to have a slight to strong arc in your putting stroke? To find out, place a few feet of masking tape on the ground (parallel to your toe line) with your putter set on top of it. A set of alignment rods works great as well. Then hit putts in this manner and assess how much the putter does, or does not, veer off of the masking tape’s straight edges. Useful tip: It also helps to assess the speed of the greens you typically play. If they’re fast, you’ll fare better with a lighter putter head. If they’re slow, a heavier putter may suit you better. 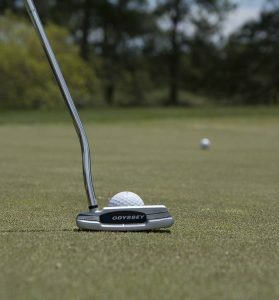 Face-balanced putters are best for players with a straight-back-straight-through putting stroke, or little to no arc. Face-balanced mallets and blade/Anser style putters have most of the weight in the face and no toe-hang, which keep the putter square throughout the stroke and naturally aid this type of stroke. Putters with moderate-to-high toe-hang (not face-balanced) are generally best if you have a slight to moderate arcing putter stroke. Most Anser-style putters are ideal for this type of stroke, because they are toe and heel weighted to provide a larger sweet spot than the traditional blade, while also aiding the natural in-to-out-to-in style of putting stroke. 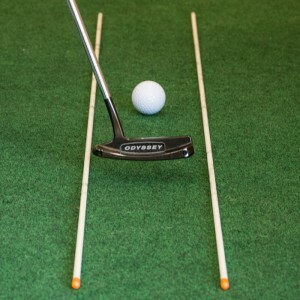 Putters with a high MOI (moment of inertia) are a nice middle ground between the above two styles, aiding both those with straight-back-straight-through and arced putting strokes. These are often either face-balanced or mid-balanced (slight toe-hang), and help the putter head reduce twisting and inconsistent roll on off-center hits for all stroke types. It’s hard to a be a good putter if you contact the ball inconsistently on the putter face. As I mentioned in the opening section, this is often due to poor mechanics. But, sometimes, it can occur from using the wrong style of putter for your stroke. If you’re one who instead tends to hit off-center putts in the same general area on the face, however, you likely have an incorrect setup of length, lie and loft. Spray some foot powder on the putter face, roll some putts and look at the dispersion of the impact points. If they’re all over the face, then you are – you guessed it – inconsistent. If the marks are pretty much in the same area yet not on the center of the face, then you likely have the incorrect length and/or lie angle, and it’s best to let a fitter fully help dial this in. Now that you’re armed with this information, use the chart below to find the putter style that fits you best and never putt with the wrong type of putter again! Keep in mind, though, while these are generally accepted guidelines for finding the right putter fit, it’s very important to find a putter that both looks and feels good TO YOU, providing confidence over every putt. 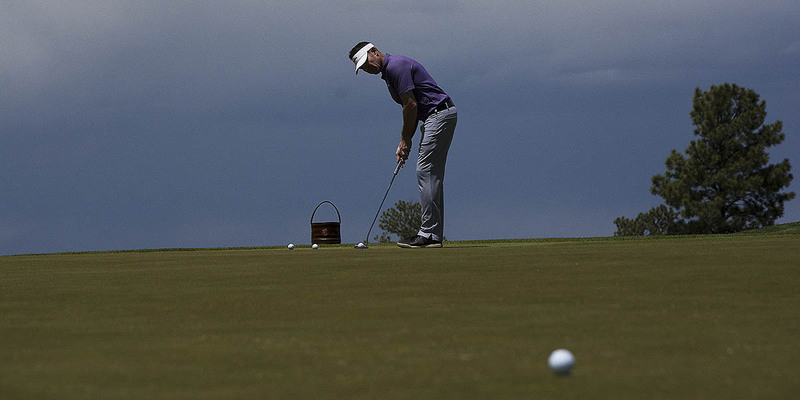 Because, like anything in golf, confidence is always the biggest key to playing your best.